Winter in Yellowstone is a long and harsh season, so when Spring arrives it's much to the appreciation of almost all the park wildlife. 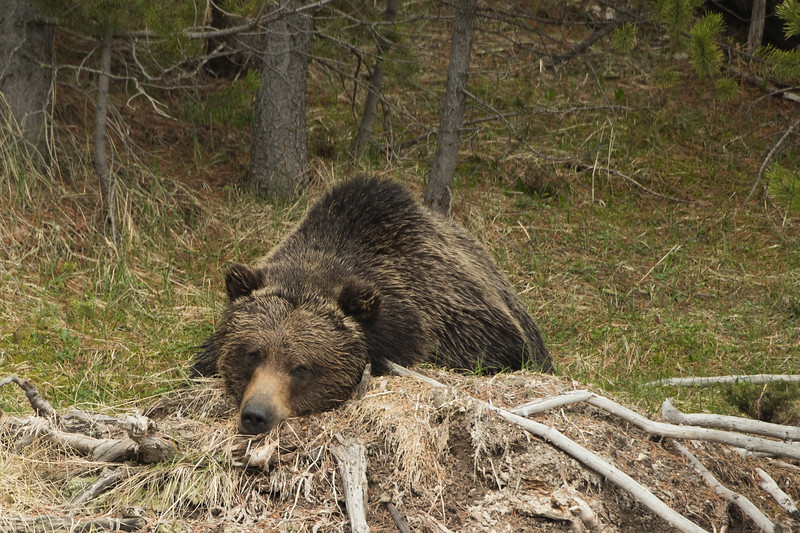 This is especially true for bears, who have spent the Winter sleeping underground in their dens. Once Spring rolls around, the bears come out of their dens and set out on a mission: eat. This Spring I had the opportunity to observe an absolutely massive boar grizzly for over 2 hours, and the entire time he seemed as happy as can be that Winter was over. He started off by making his way across an opening, finding a big tree, and doing his best to scratch off some of his winter coat. 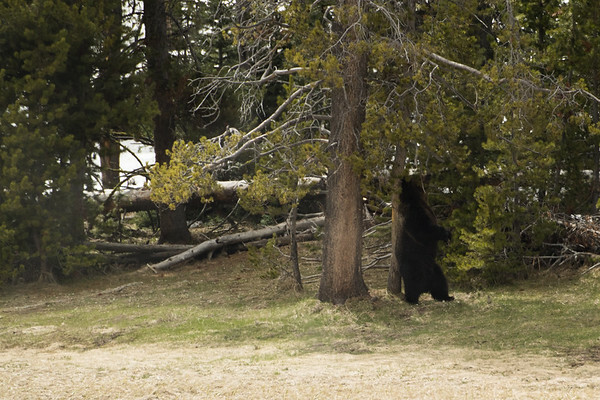 It was an awe inspiring moment, watching this huge bear reach up to roughly 8 feet to scratch itself on the tree. 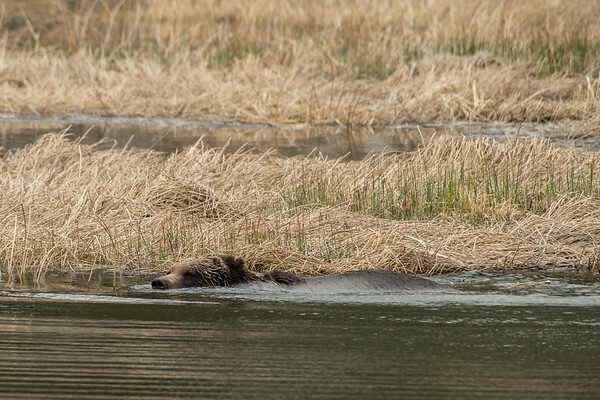 After a decent scratching session, he made his way across the wetlands in an almost cub-like fashion. Swimming and paddling his way through 5 feet of water, this big bear was having a ton of fun- plucking large swaths of grass out of the bank and tossing them into the water, then batting at them as they floated around. 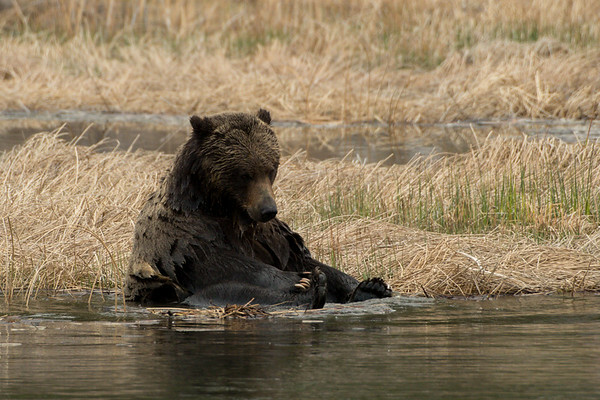 It was one of those iconic moments you see in a nature documentary; a bear truly just being a bear, splashing and playing without much care in the world. His swim and play session continued as he made his way from one large pool of water to another; the snow melt and rainfall had created feet and feet of standing water for the bear to play and cool off in. Seemingly oblivious to the crowd that had gathered, he continued to put on a show by batting at more grass floating in the water, dunking himself fully under, and paddling around. After a healthy amount of swimming and playing, the big guy started to tucker himself out; he made his way out of the water and onto a pile of down timber, grass, and dirt. At this point we had setup across the water from the big guy, and just watched him nap. He was content to sleep out in plain view, knowing full well he was the biggest baddest guy around- a black bear was slowly but surely making its way towards him until the two smelled one another, then the black bear immediately bolted away. He slept a bit longer, and even seemed to be having dreams; the bear's claws would twitch occasionally while he napped, and now and again he'd reach over and scratch himself before either turning over or falling back to sleep. Eventually he got up and wandered his way up into the woods behind him, and out of view. It was an exceptional Spring Yellowstone experience, and I wouldn't trade it for anything.